A meter-to-customer software and services platform and an advanced self-cleaning filter have been named as two of the most innovative technologies in the water industry today. FATHOM Water Management, Inc. (“FATHOM”) from Arizona and Spiral Water Technologies of California were selected by market intelligence experts BlueTech Research as likely to transform the shape of the water industry of the future. FATHOM won the Blue Truffle Award and Spiral Water won the Disrupt-O-Meter Award at the fifth annual BlueTech Forum, in San Francisco on 1 June. The winners, chosen from a shortlist of eleven companies, will be invited to join the Innovation Pavilion at the Water Environment Federation Technical Exhibition & Conference – WEFTEC – in New Orleans in September. Chief executive and founder of BlueTech Research Paul O’Callaghan said: “Utilities and industrial users of water around the world are facing real challenges – which means it is more important than ever to take an imaginative approach to solving problems. FATHOM is the software-as-a-service, cloud-based data integration platform that is changing the water utility paradigm and enabling the water internet of things with its technologyagnostic way of integrating software, databases and equipment. Developed by the Arizonabased water and wastewater utility Global Water Resources, Inc., FATHOM generates value through increased revenue, decreased costs, and decreased water demand in a way that is less expensive, less risky and easier to adopt. Through FATHOM, utilities can build sustainable, data-driven, customer-centric enterprises while managing the realities of water volatility and the increasing expectations of customers. FATHOM is already used by 4 million water customers in the US. Winner of the Disrupt-O-Meter Award was California-based Spiral Water for its selfcleaning water filter, which can be used for hard-to-treat water and can be used on wastewater, seawater and water produced from oil processing. Originally developed for biofuel production the revolutionary design features a spiral brush, which continuously cleans the filter element. The filter can deal with a high level of suspended solids, and can reclaim more than 99 per cent of water, as well as separating solids for reuse. Spiral Water Chief Executive Ashwin Gulati said: “Winning the BlueTech Disrupt-O-Meter Award is a fantastic confirmation of the huge potential of this technology. It has been put to use in difficult-to-treat applications – including oils, grease, high solids and food and beverage manufacture – but could have a huge range of applications for industrial users. Also shortlisted for the Innovation Awards were Apana, Hitachi Pegasus, Nanospun, Oasys Water, OptiRTC, Organica Water, Pasteurization Technology Group, Water Planet and Xylem. The fifth annual BlueTech Forum was attended by leading academics, representatives of clean tech companies and water industry decision makers from around the world. BlueTech 1. Paul O’Callaghan, Chief Executive of BlueTech Research, presents Trevor Hill (l), Chairman and Chief Executive, Fathom with the Blue Truffle Award at BlueTech Forum. BlueTech 2. 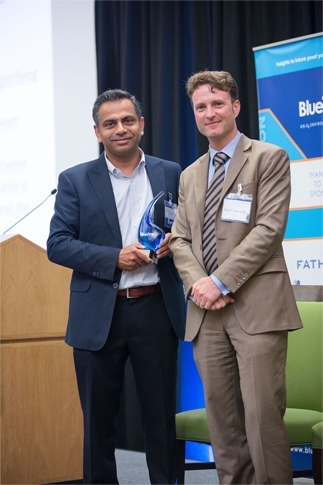 Paul O’Callaghan, Chief Executive of BlueTech Research, presents Ashwin Gulati (l), President and Chief Executive, Spiral Water Technologies with the Disrupt-O-Meter Award at BlueTech Forum. New Entrants – companies looking to enter or expand their presence in water. Strategic Investors – Venture capital and private equity investors looking to invest in the water space. Large water companies looking for strategic acquisition and growth opportunities in the water sector.